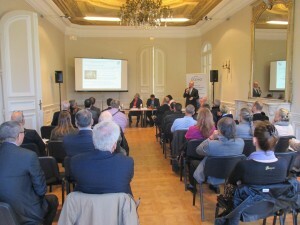 Co-organised by the Office of Mediterranean and Eastern Economic Cooperation (OCEMO), the Franco-Cypriot Chamber of Commerce and the Cypriot Consulate of Marseille, the Mediterranean debate café on Cyprus which took place on Monday the 11th of April 2016 at the Villa Valmer in Marseille was a real success. After an introduction by Pierre Massis, General Delegate of OCEMO, Jean Roatta, Deputy Mayor of Marseille, delegate of international relations, reminded us of the benefits of cooperation with the Cypriot territory and announced a very recent agreement between the cities of Marseille and Limassol. Alkis Voskarides, Consulate of Cyprus, presented this isl and as having multiple historical influences and explained that, “the isl and of Cyprus has had very long periods of prosperity throughout the centuries which has enabled it to become a country with great cultural and architectural richness, also favouring a dynamic tourist economy”. Built on the British model, the Cypriot economy has today become reactive with a stable internationalised market suitable for international investments. “Numerous large worldwide groups have taken a keen interest in Cyprus and its galvanised economy due to the recent discovery of a major gas well and have now established themselves on the isl and” indicated Elena Hadji andreou, Vice President of the Franco-Cypriot Chamber of Commerce. The isl and also has a geo-strategical interest; its geographical location allows it to act as an access point to Middle-Eastern and Mediterranean markets. Because of its neutral stance, Cyprus has long contributed to the poise of international relations (e.g. USSR-U.S negotiations in the nineteen seventies, the preparation of the Oslo agreements between Israel and Palestine etc.). The isl and’s measures and infrastructure allow foreign investors, particularly large industrial groups, “to rapidly develop their business and to benefit from an opening to new international markets” explains Panayiotis Jacovides, President of the Franco-Cypriot Chamber of Commerce. The Cypriot financial system and its implemented partnerships are beneficial to this regional economical dialogue. For companies from the Provence-Alpes-Côte d’Azur region which attended, this conference was an opportunity to get to know the isl and of Cyprus and its investment opportunities better, to exchange on the possibilities of support and to benefit from the successful experience of mister Paoli, manager of the company Cosybox. This French entrepreneur who transformed maritime containers into living spaces in Cyprus highlighted “the efficiency of the Cypriot banking, judicial, and accounting services as well as the support of the council”.